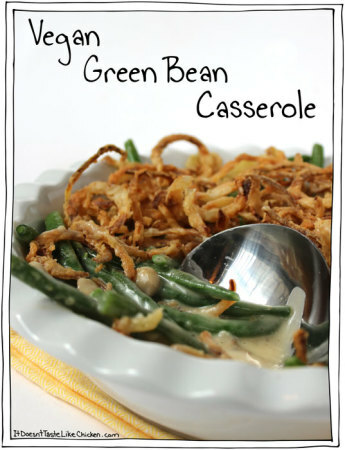 Creamy green beans topped with crispy fried onions. Soak the onions in milk for about 5 - 10 minutes. In the mean time, whisk together the flour, salt and pepper in a bowl. When the onions are soaked coat them in the flour mixture. Heat about 1/2 an inch of oil in a deep skillet, over medium-high heat. When hot fry the onions in batches until golden brown. Remove from oil and drain on a plate covered with paper towel. Bring a pot of water to a boil, and boil the green beans for just 5 minutes. Drain and rinse with very cold water and set aside. The cold water helps keeps the bean bright green and pretty. Heat vegan butter in a skillet over medium-high heat. Add the mushrooms, salt and pepper and sauté for about 5 minutes until the mushrooms have shrunken and mushroom juices appear. Add garlic and nutmeg and cook for another minute. Sprinkle flour over the mushrooms, stir and cook for another minute. Stir in the vegetable broth, coconut milk, and non-dairy milk. Cook for about 10 minutes until sauce has thickened to a creamy consistency that sticks tothe back of a spoon. Add in the green beans and heat through. Top with onions and serve hot.